Fr. White, a native of Wisconsin, has just begun his fifth year as pastor. He was an associate pastor at St. Francis Xavier Parish in Kansas City and pastor of St. Martin de Porres Parish in Belize City, Belize, Central America. Fr. White was assistant to the novice master at the Jesuit novitiate in Grand Couteau, LA before coming to College Church. 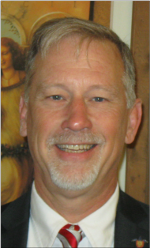 He is also a member of the Board of Trustees of De Smet Jesuit High School. Fr. Jim Caime, S.J. was born in Brooklyn, New York but grew up in southern California and New Jersey. He has lived in numerous cities and countries. Most recently, Jim spent eight years working in Beijing, China at The Beijing Center for Chinese Studies, the past four years as executive director. Jim has four masters degrees including an MBA from Georgetown University. Jim entered the Society at the age of 32 in 1993 and was ordained in 2002. He worked at Loyola University New Orleans until 2010 when he was missioned to work in China. Jim and his wife, Sue, have three children and live in Florissant, Missouri. He has been a social worker in public education for 28 years and a permanent deacon for 17 years. Jim worked as an accountant at McDonnell-Douglas Corp. before completing graduate studies at St. Louis University and Kenrick Seminary. Katie is originally from central Illinois. After spending two years as a Jesuit Volunteer in Mobile, AL, she moved to St. Louis in 1999 to attend graduate school at St. Louis University where she received her MSW. She spent 11 years in faith based community organizing before joining the College Church staff in 2015. She is married to Eric Larson and has three daughters, Molly, Alice and Elena. Mary Beth is a native of St. Louis. She joined the College Church staff in November 2005. Formerly she worked at Saint Louis University in Campus Ministry, and for the Vice President for Mission and Ministry. During that time she served on the Women’s Commission (President 2004, Staff Woman of the Year in 2001.) Previously Mary Beth co-chaired the Archdiocesan Committee on Women in the Church for the Human Rights Office. Mary Beth is a mother of two grown daughters, and a proud grandma. Joe is a native of St. Louis and has been on the staff of College Church since 1989. He leads the Christian Initiation of Adults (RCIA) process, coordinates other adult formation activities, and serves as a spiritual director. Joe lives with his wife, Mary, and two sons in Ferguson. Christine is from North Carolina and attended UNC-Chapel Hill for her Bachelor’s degree. She moved to St. Louis in 2012 for a year of service with Vincentian Mission Corps. 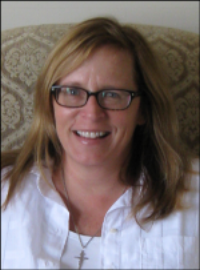 Most recently, Christine completed her Master’s degree in Social Work at SLU, during which time she worked part time as the Outreach Services Coordinator at the College Church. She is happy to have the opportunity to remain on staff and be a part of the development and growth of Social Ministry. Carolyn is a Sister of Mercy of the Americas and a native of North Carolina. After 20 years in education there she came to St Louis in 1996, where she obtained a Master of Divinity degree from Aquinas Institute of Theology in 2000. She ministered in liturgy and music in the Diocese of Belleville from then through May, 2015. Carolyn has been serving College Church since February 2016 and is the Director of Liturgy and Music. She lives as a professed member of the Mercy Institute Novitiate in Frontenac. Sandy, a native of Colorado Springs, Colorado, has been involved with the event and wedding planning business for over 20 years. Having graduated from Marquette University she was drawn to the College Church’s Jesuit parish. She is married to Carl Hauck and is the mother of 6 children, Connor, Grady, Andrew, Callahan, Jordan and Lesley. Ray was raised in New Mexico before heading to Alaska to serve as a Jesuit Volunteer. He spent several years singing professionally with the a cappella octet, Pieces of 8. He then worked as the education program manager for the Saint Louis Symphony before becoming director of choral music at DeSmet Jesuit High School. Ray became the director of the choir in 2008. He and his wife, Sue Owens, have sung in the choir for a number of years. Sue first came to College Church in 1988 as pianist for the parish Sunday liturgies and as accompanist for the choir. Additionally, she now serves as Director of Wedding Music after serving as Director of Music from 2001-2016. Sue is also a member of the Webster University and Saint Louis University piano faculties. She and her husband, Jim, both SLU alums, were married at College Church in 1991 and have two daughters, Anne and Tess. Sam joins College Church staff after finishing a year of service in the Jesuits’ Alum Service Corps. He served as a theology teacher and pastoral assistant at Regis Jesuit High School in Aurora, CO, and is bringing his educational, ministry, and service talents to our program. He is very excited to be returning to his home town and home parish.